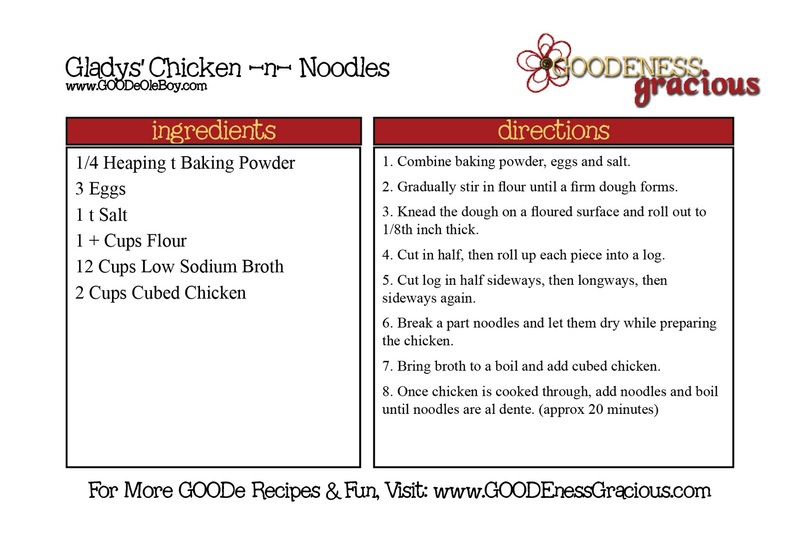 This recipe always starts with the same step… a call to Mama Goode… asking about egg/ flour ratio. Turns out that it is a heaping 1/4 t of baking powder. Boil about 20 minutes until perfection is met. Salt & pepper to taste. OK, Call me Crazy, but I love the pic with Puddie's sweatshirt wearing a bunch of flour! It's not good unless you make a good mess! Looks like I will be going to bed hungry tonight! How are you doing with food now that we are all in on your "news"? See you Monday! Love love LOVE these! Always delicious! I've never made my own noodles. Not sure what I'm waiting for…this looks awesome. Thanks for the pictorial! Love learning that way. What a sweet husband to make you such a delicious meal! gotta love a man who can cook. Ott, E can grill but rolling out dough is probably a little too advanced for him. Your dinner looks delish!! !